Hmmm…a fresh green bean recipe is best in the spring or summer but thanks to our modern food system you can eat green beans almost year 'round! They are superb when you can get them from the garden to your plate as soon as possible. You must start with fresh green beans. This is one vegetable that just tastes so much better fresh there’s no point in eating them any other way. The small, thin green beans, called haricots verts, are not usually found in our markets. They are only about 1/4 inch thick and quite tender. What you will probably find are the flat green beans which are a half inch wide. Wash and drain the beans. Snap off the stem and peel down the string towards the tail of the bean. You can repeat this on the other side. If you are getting green beans from your garden they may be so fresh and tender you don't need to do this. The next step in your preparation is to slice them on the diagonal, "Frenching" them so they are more like the haricot verts. Just slice them into 1/2 inch to 2 inch slanting strips which are only about 1/16 inch wide. You can wash and prepare them for cooking and then wrap them in dampened paper towels and store them in a plastic bag in your refrigerator until you are ready to use them. One half pound is enough for 2 people. 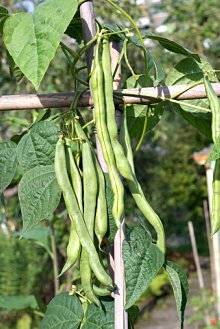 Green beans are in the legume family so they have the nutrition and fiber of dried beans and then some. They are high in calcium, potassium and B-complex vitamins. They are easier to digest than dried beans and have a higher carotenoid content than dried beans. Dr. Henry Bieler, who wrote the classic nutrition book, Food Is Your Best Medicine, recommended a broth of cooked green beans and cooked zuchinni for almost every serious malady. He said the green beans provided not only some protein but essential, alkaline minerals. Here's a simple, low glycemic, fresh green bean recipe that has lots of flavor and some omega 3 fatty acids with the pesto. Now you have some protein, some good fat and some great phytonutrients going for you in one dish. You can often find ready made basil pesto in a grocery store if you want to save time with this recipe. The cilantro pesto on this site is delicious and if you have the time make that while the green beans are steaming. Place the green beans in the steamer and steam for 5 - 7 minutes depending on how old and how big they are. Be sure to taste them so you cook them until they are barely tender but still firm. When the beans are cooked, remove them from the heat, drain well in a colander and place them in a medium sized bowl. Toss them with the cilantro pesto. Place the beans in a serving bowl, toss with pesto sauce and serve. Another wonderful fresh green bean recipe is to roast them. Line a baking sheet with aluminum foil and heat your oven to 450 degrees. Spread one pound of trimmed green beans on the foil and drizzle 1/2 - 1 tablespoon of olive oil on them tossing with your hands to get them covered. Sprinkle with 1/2 teaspoon of salt, toss to coat and distribute them evenly in one layer. Roast for 5 minutes. Remove the baking sheet and redistribute the beans so you'll get all the sides roasted. Continue to roast 5 minutes longer. Add more salt and some pepper to taste and transfer to a serving bowl. These will be very popular! You can add grated parmesan, toasted sesame seeds or chopped nuts if you like. Freshly roasted green beans are so good that they need very little seasoning. You can toss them with a teaspoon of butter or olive oil and salt and pepper to taste. You can add some fresh, Italian parsley chopped fine and a squeeze of fresh lemon juice. Fresh green beans can be steamed and added to salads or cooked in a soup. They go well as a side dish for fish, chicken or any pasta dishes. Green bean recipes can be as simple as popping them in the oven like French fries. The main thing is to get them before they get old and tough. Return from Fresh Green Bean Recipe to Low Glycemic Recipes. Return from Fresh Green Bean Recipe to Lifetime Fat Loss home page.